Astronauts in the C-131 "vomit comet" simulate weightless flight. 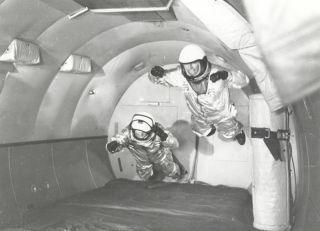 In this historical photo from the U.S. space agency, astronauts in simulated weightless flight in C-131 aircraft flying "zero-g" trajectory at Wright Air Development Center. Weightless flights were a new form of training for the Mercury astronauts and parabolic flights that briefly go beyond the Earth's tug of gravity continue to be used for spaceflight training purposes. These flights are nicknamed the "vomit comet" because of the nausea that is often induced.